Beets are a semi-hardy vegetable that grows best in cooler weather. If you provide consistent watering and some shade, you can grow them throughout the summer and into fall. Beets do not transplant well. Soak seeds for 12 hours before planting. Plant beets directly in the garden 3 weeks before the last frost date. Beets can be planted and harvested all summer long. Plant seeds directly in the garden up to 8 weeks before the first fall frost date. Amend with lots of compost and fertilizer before planting. 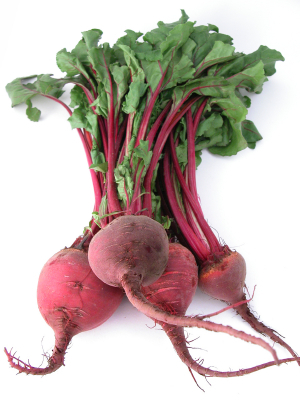 Beets are sensitive to boron deficiency, so apply and mix 2 teaspoons of Borax per square of beets before planting. Beet seeds are actually a cluster of 3, so they need to be thinned. Young beet leaves are delicious as a salad green. Harvest roots when they reach 3 inches in diameter. Yes, the beet won’t continue to grow. If I pick the leaves to eat, will that kill the beet? You move some dirt away from the top of the root, and see how big around it is. At that point sometimes the top is nearly uncovered anyway. This seems like a stupid question – but how would you know if the root is 3″ in diameter?